Queen & Snow - Behind the Scenes of "The cœur, coeur is a Lonely Hunter". . Wallpaper and background images in the La Méchante Reine/Regina Mills club tagged: once upon a time lana parrilla the evil queen snow white season 1 1x07 the heart is a lonely hunter behind the scenes photo. 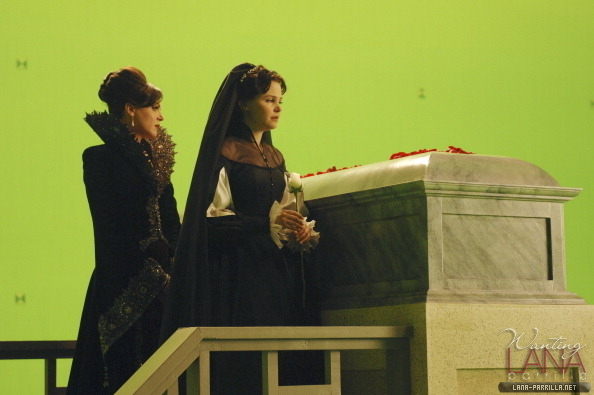 This La Méchante Reine/Regina Mills photo might contain caisse d'emballage, boîte d'emballage, caisse d’emballage, lutrin, bureau de lecture, pupitre, coiffeuse, commode, table de toilette, vanité, habillage de table, and meuble.